Discover the unique opportunity of having a conversation with your professor over lunch, outside of the classroom! Take advantage of discussing graduate school options, possible research opportunities, or general academic advice. Invite your professor for a free lunch during Lunch with a Professor Week. Sponsored by the Dean of Students, Center for Undergraduate Excellence, Office of Residence Life & First Year Experience and Office of the Vice Provost for Graduate Education. One (1) to three (3) students can invite one (1) professor to lunch on any given day during LWP week. Student(s) must arrive with the professor. Student(s) will not gain entrance to Randall Dining Commons without everyone in group arriving at the same time. Student(s) must bring voucher to gain entrance. 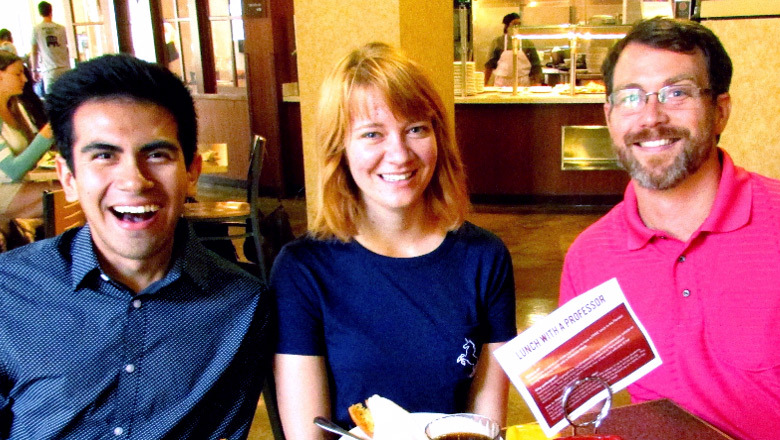 Student(s) can dine up to three different days during Lunch with a Professor week. Student(s) can’t dine with the same professor more than one time during Lunch with a Professor week. Voucher requests close 24 hrs. prior to dining date. Vouchers will not be issued after a date closes. Faculty can only dine with up to three (3) students on any given day during Lunch with a Professor. Faculty must arrive with student(s). Faculty will not gain entrance to Randall Dining Commons without everyone in group arriving at the same time. Faculty must bring voucher to gain entrance. Faculty can’t dine with the same student(s) more than one time during Lunch with a Professor week. Same day walk-ups will not be admitted to Randall Dining Commons. Request your Free meal voucher by filling out the online application at the top of this page. Within 24 hrs. you will receive your confirmation and voucher once your submission is reviewed. The day of your lunch, bring the email confirmation to the designated table in Randall Dining Commons foyer, to receive the meal vouchers. LWP is open to Rinker Campus graduate students. Student(s) must arrive with the professor. Student(s) must bring voucher to receive free lunch. Same day walk-ups will not receive a free lunch. Voucher requests for Tuesday, April 2nd will close on Tuesday, March 26. Voucher requests for Thursday, April 4th will close on Thursday, March 28th. Vouchers will not be issued after a date closes. Within 24 hrs. you will receive an email confirmation for your free meal. The day of your lunch, bring the email confirmation to the designated table at 9501 – Student Lounge, to receive your free meal.